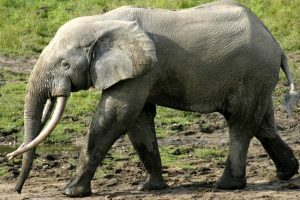 African forest elephants are smaller of the two elephant species found in Africa, the other being the bush or savanna elephant. Until 2001, they were considered the same, being collectively known as African elephants. Size: Adult males have a shoulder height of up to 8.2 ft (2.5 m), while adult females can measure up to 6.9 ft (2.1 m). Weight: They weigh between 6,050-13,440 lbs (2.7-6 tons). Color: Forest elephants have darker coloration than the bush elephants found in the savanna. 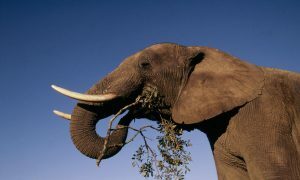 Tusks: Their tusks are harder, straighter, and downward pointing in contrast to the bush elephants’ curved tusks. They are yellow or brownish. 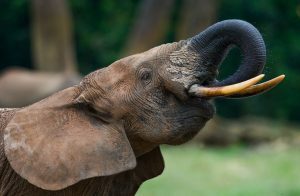 The tusks can grow to up to 5 ft (1.5 m) and weigh 50-100 lbs (23-45 kg). 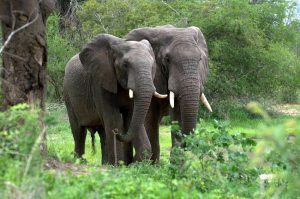 These elephants are found in the Congo Basin, in the countries of the Democratic Republic of Congo, Central African Republic, Gabon, Ghana, and Ivory Coast. They live in the dense, tropical rainforests. Forest elephants tend to move around in groups smaller than those of their African and Asian cousins. These groups may contain 2 to 8 elephants. Individual groups usually do not mingle with one another. Once mature, males disperse from their natal area, but females exhibit philopatry, i.e., the tendency to return to the place of their birth to breed. Adult males are solitary, coming together with other elephants only to mate. The hierarchy of male dominance is based on size. These elephants are herbivores. Their feeding habits vary seasonally. During the wet season they live on fruits, but when it is dry, they usually make do with leaves and grasses. They use their trunk as an appendage to pluck their food and putting in their mouth. They are polygynous, and males may have more than one female mate at a time. Males experience an aggressive state called ‘musth’ between the ages of 15 to 25 and can be rather unpredictable during these periods. A fluid is secreted from the temporal glands between the ears and eyes, which they rub on bushes and tree trunks to spread the scent. There is no fixed breeding season, as the females are polyestrous, and can conceive at any time of the year. The gestation period for forest elephants is between 22 and 24 months, after which the mother gives birth to a single calf (twin births are rare), weighing around 232 lbs (105 kg). 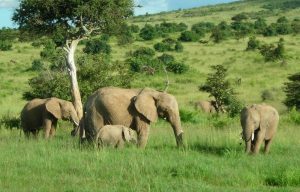 Females usually breed once every 5-6 years, devoting all their attention to train their calf about the nuances of being an elephant. It takes around a year and a half for the tusks to emerge for the calves. They are weaned at about 4-5 years of age. They eventually become independent when they are around 13 years old. Males reach sexual maturity between 8 and 15 years old, while females do so between 11 and years of age. They live for around 60-70 years in the wild. The primary mode of communication for forest elephants is by sounds of low-frequency, around 5 Hz. They also communicate through chemical (scents) and tactile channels. Because of their poor eyesight, they have excellent senses of smell and hearing. They can hear and recognize vibrations in the ground, as well as smell food sources from great distances. Their sturdy trunk, as with all other elephant species, is highly dexterous, being able to be used in a variety of ways. The trunks end in two opposing processes or lips, a feature exclusive to the African elephants (both species). 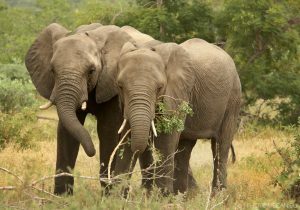 Their ears are more rounded and smaller than the bush elephants’. They flap the ears to cool their body temperature down by almost 10°F. They use their tusks to plow through the dense forests they inhabit. Males sometimes have tusks long enough to reach the ground. The wrinkles in the forest elephants’ skin also help them to keep cool by giving the heat a bigger surface area to disperse through. Their feet are sensitive enough to detect vibrations from the ground. 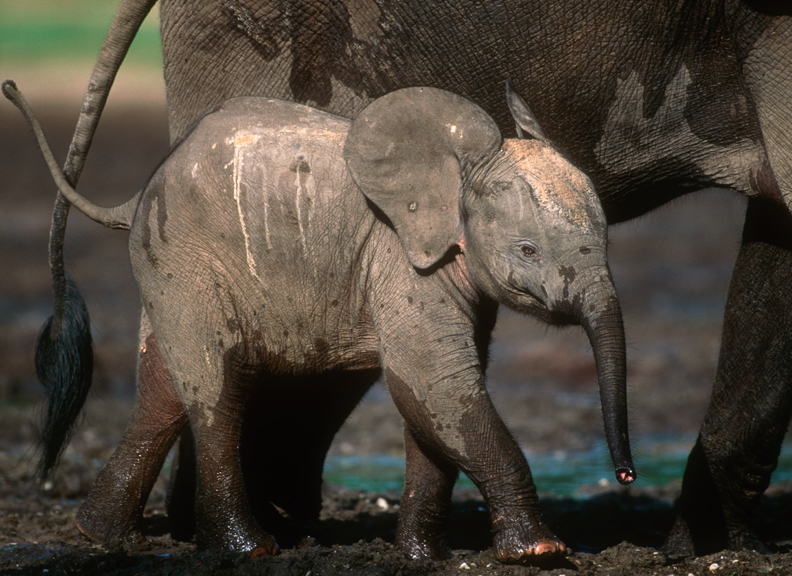 Like all other elephant species, adults do not have any natural predators in the wild. Calves may rarely be hunted by carnivores sharing their range. 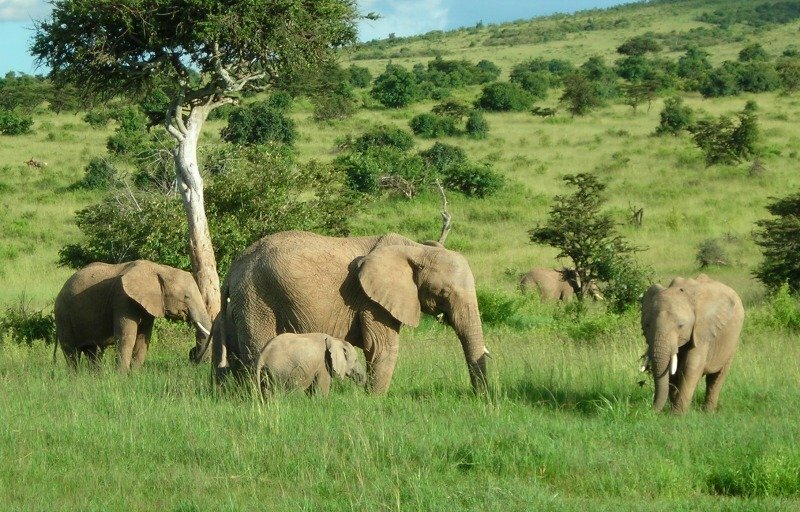 Since this species has been so recently described and separated from the bush elephants, as well as their habitat being unsuitable for detailed study, the conservation status of forest elephants is yet to be evaluated. 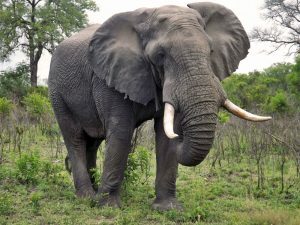 But along with the bush species, the forest elephants are classified as ‘Vulnerable.’ The species has been poached for decades for the ivory from the tusks. The ivory from their tusks is the most sought after because of its toughness, more so than those of the bush and Asian elephant. By a study conducted in 2015, an estimated 100,000 forest elephants are left in the wild. 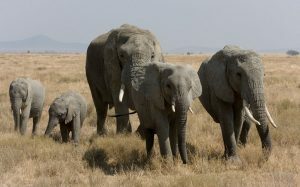 They constitute about 33% of Africa’s total elephant population. These elephants are one of the largest terrestrial mammals in the world, trailing the bush elephant and Asian elephant in terms of size.